Toby is also the Founder and Director of the Columbia Center for Theatrical Arts, Inc. (CCTA). In 1972, at the invitation of visionary developer James Rouse, she created a school for young people who possessed an interest in the performing arts. A special group of those students, The Young Columbians, were invited to the White House and performed a musical tribute to America during the Bicentennial Year (1976). The Young Columbians still perform today at special programs all over Maryland. 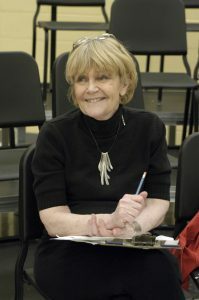 Over the years, as a respected leader and advocate for children and the arts, Toby has been regarded as the matriarch of the performing arts in Howard County and all of Maryland receiving countless honors. Among these are Columbian of the Year, Arts Advocate of the Year, Outstanding Woman in the Arts (MD State Department of Education) and is a Helen Hayes Award winner for Outstanding Direction in a Musical for her production of Jekyll and Hyde at Toby’s Dinner Theatre. She was also selected as a Marylander of Distinction by Maryland Life magazine and was inducted into both Howard County and the State of Maryland’s Woman’s Hall of Fame. Recently she was honored by the Howard County Commission on Disabilities with the Leadership Award for Accessibility. In operation for 40 years, over 200 productions with over 100 Helen Hayes Award nominations, Toby has so much to be proud of and thankful for but nothing more so then her husband, two children and four grandchildren.